Habit: Generally perennial herb, tufted or occasionally rhizomatous. Stem: generally erect, generally unbranched at distal nodes, persistent or not. Leaf: basal or cauline, sheaths open, auricles 0, ligules scarious to membranous, generally ciliate, blade flat to inrolled. Inflorescence: generally panicle-like, generally narrow. 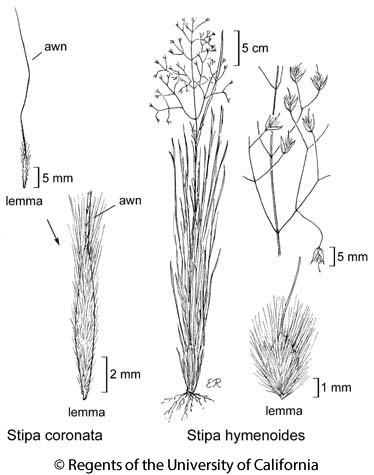 Spikelet: generally 1-flowered; glumes generally > floret except awn, membranous, flexible, veins 1--10, awns 0; floret 1(6), generally round (compressed) in ×-section; axis breaking between glumes and floret; callus blunt to sharp, glabrous to hairy; lemma membranous to leathery or hardened, glabrous to hairy, obscurely 3--7-veined, margins overlapping or not, tip entire to 2-lobed or forked, occasionally fused into a crown, 1-awned at or near tip (mucronate), awn (0)3--225(300) mm, unbranched, straight to bent or curled, twisted or not, persistent or not; palea < to > lemma, generally flat, glabrous to hairy, veins (0)2(3). Fruit: ovoid to fusiform, beak 0. Species In Genus: +- 600 species: temperate, tropics, generally +- arid, +- worldwide; many species valuable cattle forage, cordage, some weedy. Etymology: (Greek: stupe or stuppeion, for fiber or cordage, referring to plumose awns of Eurasian species or fibers from especially Stipa tenacissima L.) Note: Floret, lemma lengths and shapes in key and text exclude awn. Many related and some poorly defined genera placed here in a broadly treated genus. Hybrids not rare. 4 waifs in California, Stipa caudata Trin. [Amelichloa caudata (Trin.) Arriaga & Barkworth], Stipa clandestina Hack. [Amelichloa clandestina (Hack.) Arriaga & Barkworth], Stipa plumosa Trin. [Jarava plumosa (Spreng.) S.W.L. Jacobs & J. Everett], Stipa tenuissima Trin. [Nassella tenuissima (Trin.) Barkworth] . Stipa viridula Trin. [Nassella viridula (Trin.) Barkworth], possibly in California but records unclear. Stem: 2.5--7 dm. Leaf: sheaths glabrous to minutely scabrous or distally puberulent; blade +- = stems, 0.1--1 mm wide, margins generally inrolled. Inflorescence: 9--20 cm, open. Spikelet: glumes 5--9 mm, +- lance-ovate, sac-like; floret 3--4.5 mm, 1--2 mm wide; callus 0.4--1 mm, sharp; lemma +- 3 mm, densely long-hairy throughout, hardened, dark brown to black, hairs easily removed, awn 3--6 mm, not bent, early-deciduous, scabrous. Chromosomes: 2n=46,48. Ecology: Desert or sagebrush scrub, pinyon/juniper woodland, in dry soil, generally sandy; Elevation: 60--3500 m. Bioregional Distribution: CaR, SN, SnJV, SW, GB, D; Distribution Outside California: to Yukon Territory, Manitoba, Minnesota, Arkansas, Texas, northern Mexico. Flowering Time: Apr--Jul Note: Hybrids with Stipa occidentalis var. occidentalis called Stipa ×bloomeri Bol. [Achnatherum ×bloomeri (Bol.) Barkworth; Oryzopsis bloomeri (Bol.) Ricker ex Piper]; Barkworth 2007 FNANM 24:142. Citation for this treatment: J. Travis Columbus, James P. Smith, Jr. & Douglas H. Goldman 2012, Stipa hymenoides, in Jepson Flora Project (eds.) Jepson eFlora, http://ucjeps.berkeley.edu/eflora/eflora_display.php?tid=45649, accessed on April 19, 2019. CaR, SN, SnJV, SW, GB, D; Markers link to CCH specimen records. Yellow markers indicate records that may provide evidence for eFlora range revision or may have georeferencing or identification issues. Purple markers indicate specimens collected from a garden, greenhouse, or other non-wild location.